It started with the tree. The mimosa tree, planted the first spring I lived in this house, had become a thing of beauty loved by myself and all of the neighbors. It grew with a fairly short main trunk which divided into two major branches, holding its broad umbrella canopy partly over my back yard and partly over my right-hand neighbors’ yard – one limb each. They have a two-story house, and very much enjoyed looking out of their upper windows onto its smoky pink blossoms. I spent a lot of time watching the scrappy little hummingbirds chase each other around while arguing over the best flowers. I loved the way all of its leaves closed up after dark. On warm summer evenings, I always made sure to tell it good night. It was always the last thing to wake up in the spring, and the last to go to sleep in the fall. This year, right before Thanksgiving (that’s at the end of November for you non-USA readers), we had several days of high winds and pounding rain and general icky weather. But the house and the yard held up quite nicely and life went on. What are you guys doing? I said as I strode purposefully down the hall. Because Moo Cow and Captain Kidd had acted guilty, so I was immediately suspicious. But as I wandered through the house, nothing seemed amiss. I looked out the front window. Everything looked OK. I looked out the back door. My beautiful, beloved mimosa had split in two, right down the trunk. Sadly I went outside to survey the damage. The limb overhanging the neighbors’ yard still stood. The part overhanging my grape arbor was down. But, thoughtfully, it had missed every major structure in the yard, including the house and back fence. 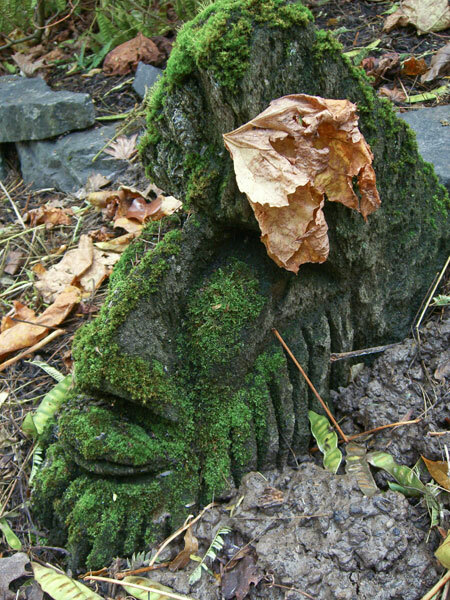 My little backyard head sculpture (named Todd the weather god long ago by #1 Son) sat sadly amongst the litter of branches and seed pods, with one grape leaf clinging forlornly to its forehead. The only bit of damage appeared to be the last 2×4 slat on the arbor, which had been knocked off but not broken, and possibly a minor limb or two on the mini cherry trees. The split started at the divide of the major branches and went nearly to the ground. It was something of a miracle that half still stood. And it was a good thing, as that half would have taken out the fence and most likely done some damage to their yard and maybe their house. It was fairly obvious the tree could not be saved. With great sadness I contact the Yard Guy and told him that the tree would need to be removed, and he might as well do the winter clean up while he was here. We’ll come next Monday, he replied, and added That’s too bad. I always liked that tree. It was a really pretty one. We’ll clean your gutters while were there, too. I made a mental note to check the grape vines over the weekend and see where all they’d gotten to. The grapes have a tendency to want to come in the house, and have been known to wrap themselves around #1 Son’s bedroom window and through the window screen, which is right there next to them. 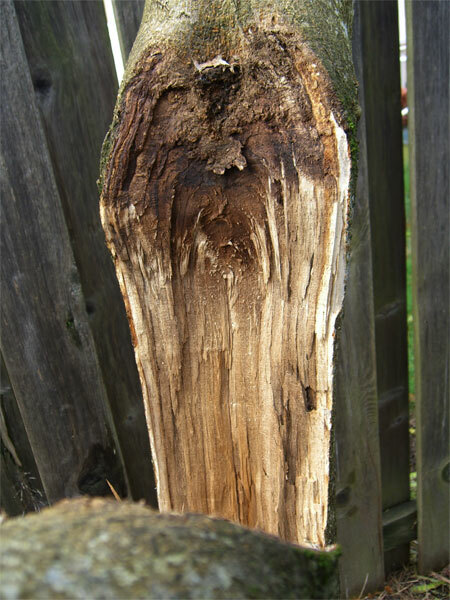 I wanted to show the vine the error of its ways before the Yard Guy came, and at least pull it away from the shutter. On Thursday, my cell phone rang just as I was walking into a meeting. Since the meeting hadn’t started yet, I answered. 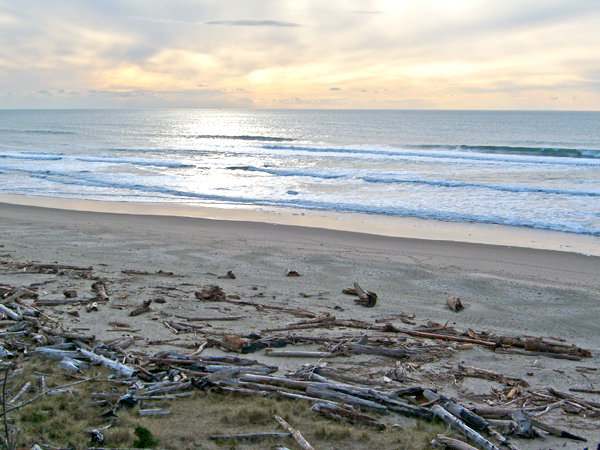 I felt an immediate surge of adrenalin and was instantly on high alert. I’m leaving now and I’ll be home in 20 minutes. The Sheriff can call me at this number. I poked my head in the door of the meeting room and said, sorry, gotta go, house being burgled and ran for the parking lot. As I ran, and drove, I wondered if the cats were OK, and the computers, and the special big plastic box, and the yarn stash (surely they would not want my yarn stash?). Oh the poor cats. Kidd would freak out and die outside in the cold. Had I really remembered to store all of the exceedingly important files off site? My house! Half way home, my cell rang again. Hi. This is the Sheriff. I checked out your house, and everything looks OK. There’s a crew there doing some yard work. Looks like they rattled the window or something. But everything was locked up tight. I don’t think you need to hurry home. Looks OK! I thanked the Sheriff and proceeded home. And, sure enough, there was Yard Guy and his crew. The mimosa (RIP) lay in pieces on the font lawn while a couple of guys cut it up and tossed it into a big truck. Many loud, gas-powered, testosterone-driven tools were at work, drowning out the neighborhood peace. Yard Guy was in the back of the truck, loading up tree parts. I walked over. Hi there! I wasn’t expecting you today. I shouted. Yard Guy: We weren’t doing much today, so I decided we might as well come over and take your tree out and do your clean up. Did you know the Sheriff was here? Me: Yeah. I am aware of that. That’s sort of why I’m here. Yard Guy: Oh! Yeah. I rattled a back window or something, getting the grape vines off of it. Apparently your alarm went off, but I didn’t hear it. It might still be going off. Come in the back yard and I’ll show you what were were doing. Now, gentle reader, my alarm is very loud. I have set it off a time or two myself, accidentally. Not only does it use a piercingly shrieking, air-raid siren loud alarm, but it yells at you. In English. Warning! You have entered a secured area. Leave immediately! The entire neighborhood can hear it. The fact that, standing in my back yard, I could not hear it at all – and in fact could barely hear it with my ear pressed against the window – gives you an idea of the noise being generated by the yard crew and their myriad tools. I went inside, where the sound of the alarm was quite noticeable, and shut it off. Then went back outside to shout have a conversation with Yard Guy. Yard Guy: I thought I sort of heard something. But nobody else could hear it, so we just ignored it. Do you want me to put that 2×4 back up on the arbor? Me: Yes, please. That would be very nice of you. As well as taking out the tree and mending the arbor, they also cleaned out the gutters (and repaired one that was coming loose), trimmed and pruned and edged, and got the yard ready for winter. I really do love Yard Guy and his crew. They do a wonderful job. It was just that they didn’t come when expected, and I didn’t have time to get ready for them. Unfortunate, you know. Next… there is more… and maybe knitting, too. This Christmas we tried something new. Usually #1 Son comes to my house for dinner and present opening, and we watch a movie or whatever and just chill. 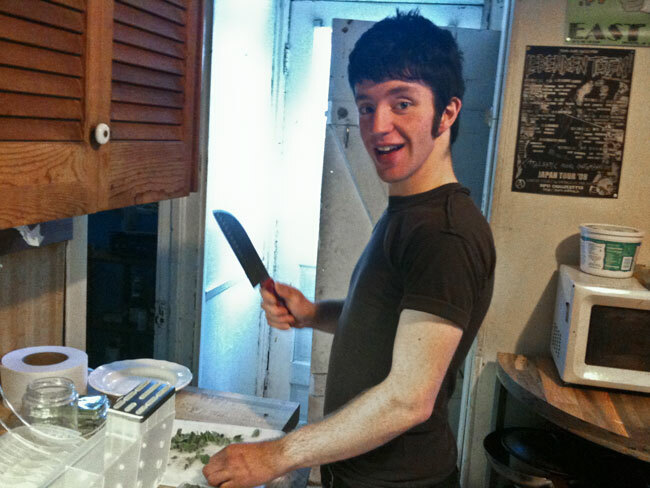 This year I asked #1 Son if it would be fun if I came to his house instead, and we could cook together and feed which ever of his roommates or friends were around and hungry? He thought that sounded fun, and we planned accordingly. A couple of days later, he mentioned that his Totally Adorable Girlfriend™ would be in town. I said that she, of course, would be welcome, too. A couple of days after that, he mentioned that TAGF’s™ father, J, (who lives in Portland), would like us to all come to his house instead. I wasn’t sure if I was really ready for the whole meet the ‘rents thing. But we try to go with the flow around here. Which we take over to J’s house, where he and TAGF™ will have crafted the rest of our feast. And feast it was! 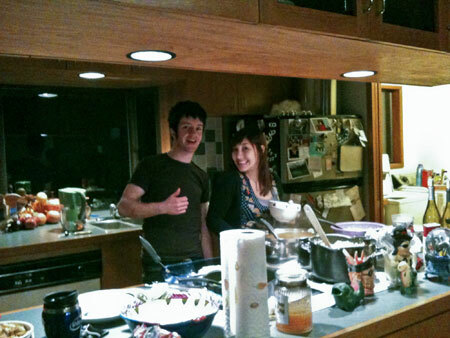 #1 Son and I contributed the stew – amazing stew! – couscous with hazelnuts, and a bottle of wine. J broiled a wonderful halibut dish. And TAGF™ mashed potatoes, steamed asparagus, and baked a cheesecake for dessert. All of the food was amazing, and I ate a lot of it. We all did, actually. J was a gracious host and I enjoyed meeting him. I had a very nice time. There was a bit of present swappage, too. Look! 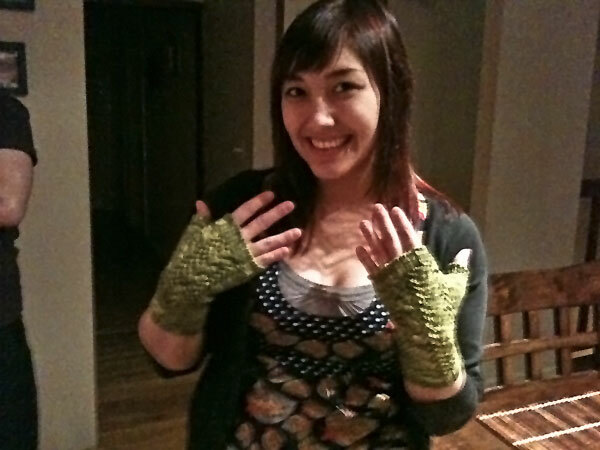 I knit something! I finished these just last night, for TAGF™, which means it’s probably the last finished object of 2009. 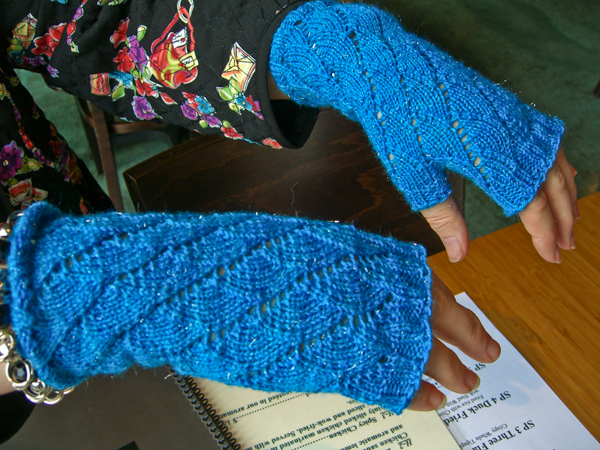 Modifications: continued cuff ribbing on the palm side all the way up the wrist; fussed with the thumb a little. It appears that she likes them! When questioned, #1 Son had told me that her favorite color was chartreuse. I wasn’t sure whether to believe him or not. #1 Son can be a bit of a kidder, and sometimes it’s hard to tell if he’s being serious or not – especially via text message. This was the chartreuse-est yarn I could find in my stash. All the time I knit I kept fingers and toes crossed that she really did like green. But she assured me that she really does, and her favorite color really is chartreuse. #1 Son told me that he didn’t even know what color chartreuse was and he’d had to look it up, so there was no way he could have actually been kidding about it. #1 Son got his big present a few weeks ago, but I gave him a little space heater for his room. He lives up in the attic of a 100-year-old house, and it’s cold in the winter. This one can also be used as a fan without heat, so it will also be useful in the summer when his room is too hot. #1 Son gave me a bit of bling for my ears. 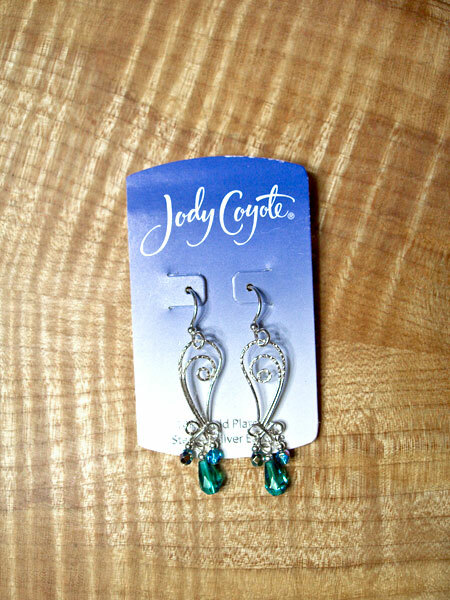 Aren’t they pretty and sparkly! I can’t wait to wear them. And also a cute little lantern candle-holder to hang outside in the summer. TAGF™ gave me this. 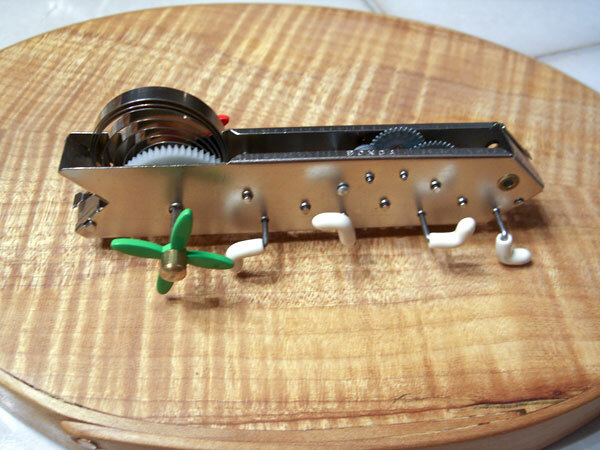 I have no idea what it is, but it has lots of little gears that whir and springs that wind and little feet that go around as it scuttles across the table. The geek factor is high and I like it! It’s a minor upgrade this year, but oh such an important one! 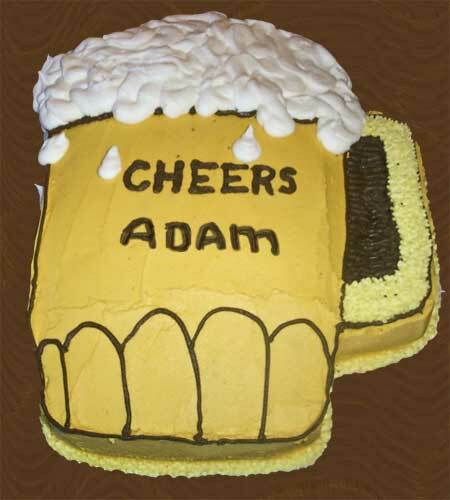 Adam, this has been an interesting year that has seen its ups and downs. Congratulations to you on not only living through it (mostly with a fine measure of grace), but coming out the other end wiser and so mature and so all-grown-up. It takes my breath away to remember that 21 years ago you were still a part of me. And now you are so many things: musician and business man and artist. And… congratulations on finally being able to legally enter the bars that you and your band have been playing in for the last 5 years. Love you, sweetie! Happy birthday. This flu thing… it really got me down, gentle reader. But I am finally on the mend, and heartily glad! Hopefully I will have energy now for little things like, well… blog posting. I was even too sick to go to my 40th 8th grade graduation, which bummed me out to no end. And it’s been hard, you see, to talk about knitting. This project — can’t talk about it because it’s secret. And I can’t tell you about that project either because — it’s secret. And there’s a third project I can’t tell you about because (do I sound like a broken record?) — it’s secret. So I am having to wait until secret projects get finished and to their intended recipients before I can show them to you. And that makes for boring blogging. I did go to the annual auction with my MIL a while back. But, alas, the economy held me back. I bid on only a few items in the silent auction this year, and I didn’t bid at all during the out-loud auction. 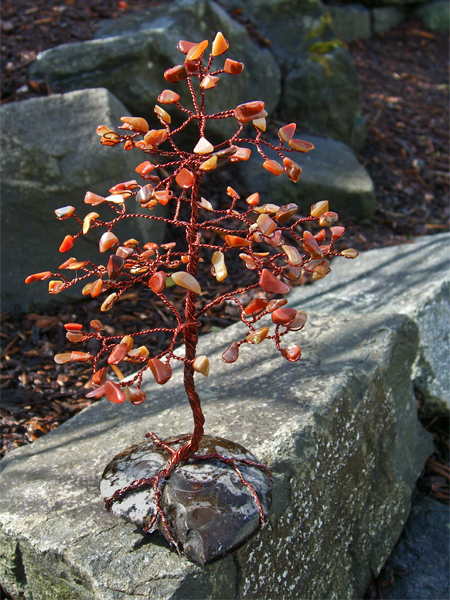 Of all of the things I bid on, this little tree is the only one that I was high bidder. It was my favorite thing I bid on, so I’m glad it came home with me. All of the little leaves are pieces of petrified wood, and the base is a fossil ammonite. It makes my inner geek feel all warm and fuzzy. There is one secret project that I am able to show you. These mitts went to my friend L last Friday. She’s modeling them. She wears several rings, so gloves are out. 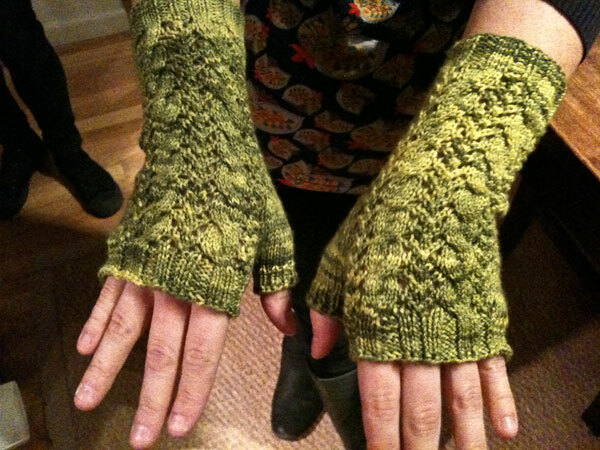 But fingerless mitts just fit the bill. And she loves glittery, shiny things. I wish that the Glam Sock sparkles photographed better. Yes, it really is that blue! Yarn: Stitchjones Glam Sock (63% superwash merino, 20% silk, 14% nylon, 2% silver), 420 yds per 3.5 oz/100 g skein, in colorway Marine — I used a fraction of the total and have tons left.